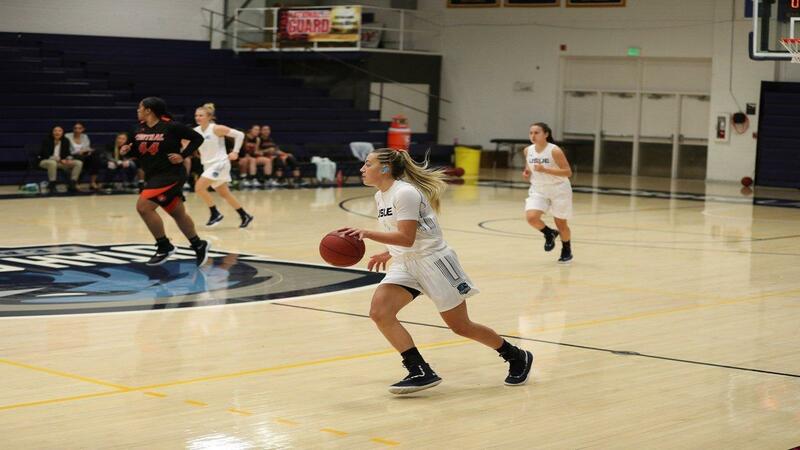 PRICE – Utah State Eastern women’s basketball lost in overtime to the Western Wyoming Mustangs 87-85 on Friday in Riverton, Wyoming. The loss snaps a six-game winning streak for the Eagles and it also gives them their first road loss of the season. Utah State Eastern Head Coach Chelsey Warburton said the team’s shooting and defense on Friday night played a role in not getting the win over the Mustangs. The Eagles shot 23% from three and 38% from the field. “We had good looks down the stretch that we didn’t convert but we also gave up way too many points,” said Warburton. USU Eastern had five players in double-figures on Friday night with sophomore Abby Butler leading the way with 20 points. Butler also was second on the team in rebounding with 10 boards. “She was the reason why we were in the game. She made great, great hustle plays that helped us tonight,” said Warburton. Warburton’s other sophomore leader, Alyssa Crumley, also had a double-double against the Mustangs with 12 points and a team-high 11 rebounds. For the second straight night the Eagles had a big night off the bench from freshman guard Emmery Wagstaff. Against Western Wyoming she put up 17 points, seven rebounds, and two steals. It might have been a loss on Friday but Warburton said she was proud of her team. “We learned as a team that we don’t give up. I am proud of the team’s effort in each game that we have played this season,” said Warburton. The Eagles now have a 9-2 record and will have a week to prepare for a road trip to La Junta, Colorado next Saturday against Otero. Tip off for Saturday’s game against Otero is scheduled for 1 p.m.